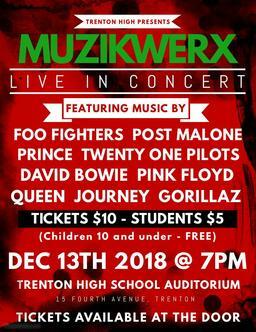 December 12, 2018—Students at Trenton High School  have worked hard to prepare for the upcoming Muzikwerx show and now they’re ready to perform! This annual concert features a 5-piece band and choir performing contemporary hits by Twenty One Pilots, Foo Fighters and Post Malone as well as older classics by Queen, Pink Floyd and David Bowie. Tickets are available at the door, $10 for adults, $5 for students and children 10 and under are free. Come for the show, maybe win a door prize and leave feeling inspired!